I haven't done a portrait costume analysis in a long time, but it seemed like the most appropriate way to deal with the second Historical Sew Monthly challenge: Blue. 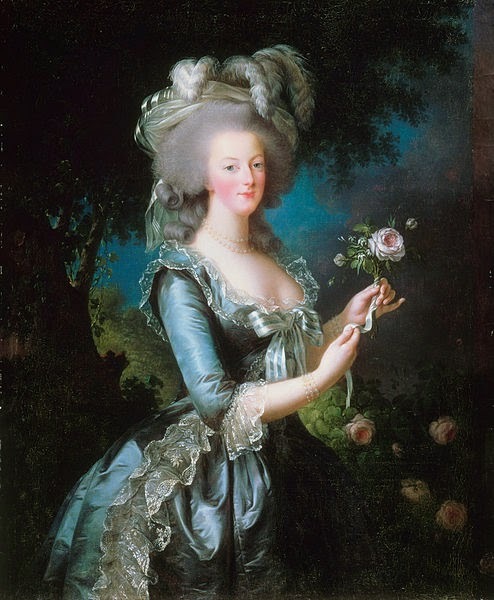 This portrait of the twenty-eight-year-old Marie Antoinette was painted in the same year as the famous portrait en chemise - in fact, it was painted in order to replace the chemise portrait with something less scandalous. (You may notice that she's standing in the same pose, holding the same ribboned rose, with the same hairstyle and same expression.) While this blue taffeta gown is more traditional than the chemise, it's nothing like a robe de cour or a robe parée - two outfits worn daily at court for formal occasions. This is still a very fashionable and casual ensemble. 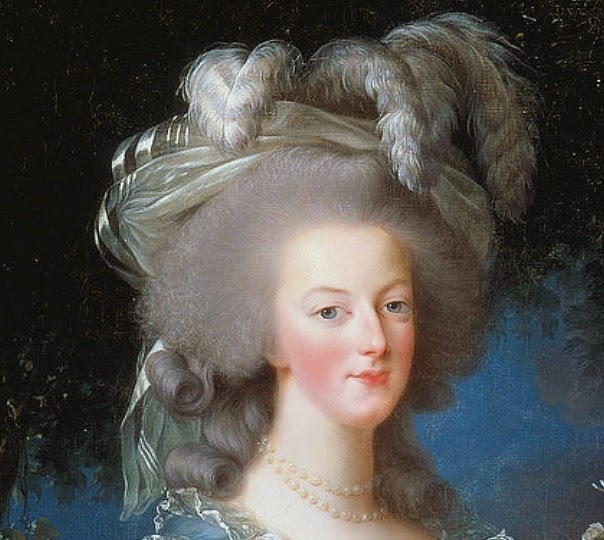 Starting at the top: instead of the straw hat worn in the original, this version of Marie Antoinette is coiffed with a silk turban trimmed with ostrich plumes. The turban, made of a satin-striped sheer silk, was a fashionable bit of orientalism; a slightly later portrait of Madame Elisabeth shows a pouf cap in a very similar fabric, also trimmed with a white plume. Her hairstyle is an hérisson ("hedgehog"), with curls hanging down behind à la consellière (a style possibly named after Charles Alexandre de Calonne, a French statesman and counselor of Louis XVI). On her wrists, she wears triple-stranded pearl bracelets, matching the double-stranded necklace seen above. 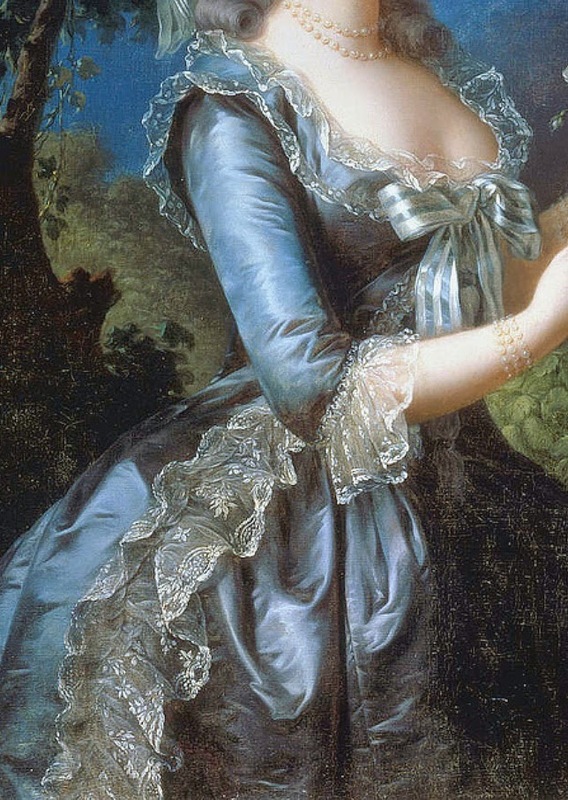 Pearls were highly fashionable and very expensive; perhaps their connotation of purity was meant to counteract the scandal of the original portrait. So, the gown itself. I'm hesitant to put a name to it, because there was no exact science to gown-naming - Marie Antoinette's dressmaker Rose Bertin could have called it a polonaise, circassienne, or turque if she'd wanted. Why? Well, look at the queen's waist: the dress hangs away from the body, fastened only at the neckline with a parfait contentement (the technical term for a chest-bow). The looseness of the gown was, like the turban, a bit of Eastern influence as the traditional forms of women's dress (the gown and the sacque) were fully fitted to the torso, if only in the lining. All three of the gowns listed above were originally conceived as variations on the unfitted theme. In their original forms the polonaise and circassienne were cut with rounded skirts, pulled up in the back, while the original circassiennes and turques both had short oversleeves; circassiennes often had "exotic" trims, such as tassels or fur. Regardless of the proper term - each one has justification - this is neither a standard fitted gown nor a formal sacque. The queen could be wearing a very wide stomacher underneath the gown, or a back-lacing waistcoat, as both are attested in fashion plates - either way, there is a strip of white trim down the center, pinched at intervals with a darker material. The gown itself is trimmed around the neckline, down the front (possibly also around the bottom of the gown, if it really is a polonaise or circassienne), and on the sleeves with either a fine lace or a very clear, whiteworked muslin or gauze: trimming on all edges was a common fashion, as was white gauze. There's also an unembroidered white ruffle along the neckline that is probably a tucker or tour-de-gorge, sewn to the edge of the shift. The ruffle along the front edges of the gown is narrow along the torso and flares around waist level, behind the arm, to several inches wide; along the skirt, the ruffle is sewn down just above the center, creating a long "head". The sleeve ruffles are even less balanced, with a tiny head. There's an attached collar of the same blue silk as the gown, trimmed on both edges with a white ruffle. 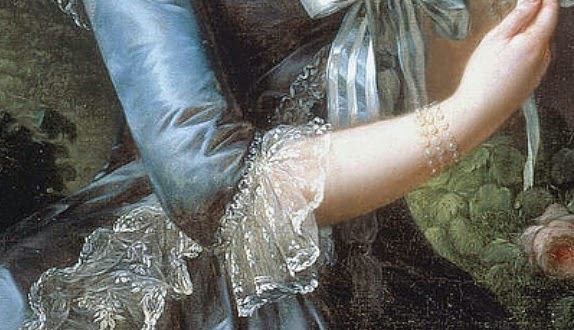 This collar appears to have a deep point in back, judging by the edge seen behind Marie Antoinette's right arm. Collars are sometimes seen on robes à la turque, circassiennes, and lévites (although this gown probably isn't a lévite, as they were generally sashed). It's highly likely that the petticoat had an embroidered volant ruffle that matches the one on the gown. Unfortunately, the portrait isn't full length - so it must be left a mystery, just like the name given to the gown. Thank you, I have never really looked at the gown here, I just brushed it off as another generic polonaise-type dresses. It is really interesting to see it looks like zone-fronted robe?